The craft beer world loves its collaborations much like winemakers enjoy creating blends and mixologists take great pleasure in making a new view on a classic cocktail. Collaboration beers are often the trophy beers for brewery, packing more punch, more hops, more herbs, more…something. They often aren’t collaborating together to make the finest Czech-style lager. You hear all the time about gypsy brewers traveling the world, crafting the epic likes of tequila barrel aged stouts and persimmon infused bitter ales. Enter Garrett Oliver, Brooklyn Brewery’s brewmaster and best known currently as the brewer of the White House’s Honey Ale, and his good friend from across the pond Hans-Peter Drexler, brewmaster at the 400 year old Schneider Brewery in Kelheim, Germany. You have cultural exchanges all the time between the U.S. and Europe. But, to have an American brewer take over a legendary Germany brewery and vice versa? This can’t be. And yet, it did happen, producing a majestic weissbock as the result. Both brewmasters brewed their version of a weissbock at the other’s brewery, using their own yeast to express their own brewery style, but local hops to demonstrate the terroir where the beer is being brewed. Both beers have the best of the Old World and the New World. At just under 8% ABV. and with the bitterness of the hops tamed impressively, this Brooklyn version made at Schneider isn’t your typical grand, bombastic collaboration style ale (think the hoppiest triple IPA ever!). The pale ale-reminiscent Hopfen-Weisse is elegant, boasting a radiant golden-orange hue, almost as if the sun had a half hour before setting into the Pacific. The nose yields traditional hefeweizen notes of clove, cinnamon, and banana, with some kumquat, and even a touch of rye is detectable. 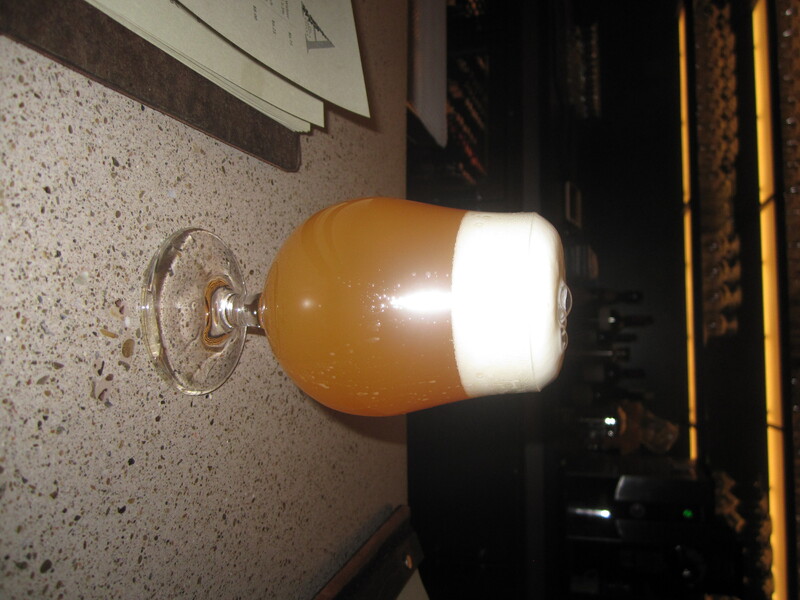 The handsome beer starts with a very frothy head, as if a barista crafted it. After a few sips, you get a very clean, not too sweet lingering taste of the banana and cloves on the palate, with plenty of citrus-Mandarin orange notes appearing from the hops. It’s almost as if you added a pinch of Grand Marnier to your banana bread recipe. Enjoy with seafood, perhaps a smoked salmon or herring-based starter, or I certainly can imagine the Hopfen-Weisse pairing delightfully with a tomato-sauced based seafood pasta or a cioppino. Of course, now we’ll have to sample the Schneider version made in Brooklyn. This is a collaboration and a competition…this will be one close match. Great brewers often make great brews in any brewery. They’re masters of the art. This entry was posted on November 15, 2012 by trevsbistro. It was filed under Beer of the Week .